Pregnant or not pregnant? Knowing for sure is important – whether you wish to have a child, or currently have other plans and wish to delay pregnancy. In either case, a pregnancy test will give you this important information. The test is based on the detection of the pregnancy hormone, hCG (human chorionic gonadotropin). If a pregnancy has occurred, the concentration of hCG increases. After reaching a certain level, the hormone can be detected in urine. Pregnancy tests are differentiated by when they can be administered. So-called early-detection tests can confirm a pregnancy even when there are only very low concentrations of hCG. These tests can be administered even before your regular period is due. Traditional pregnancy tests require a higher concentration of hCG to confirm a pregnancy and can be used starting the first day of your missed period. 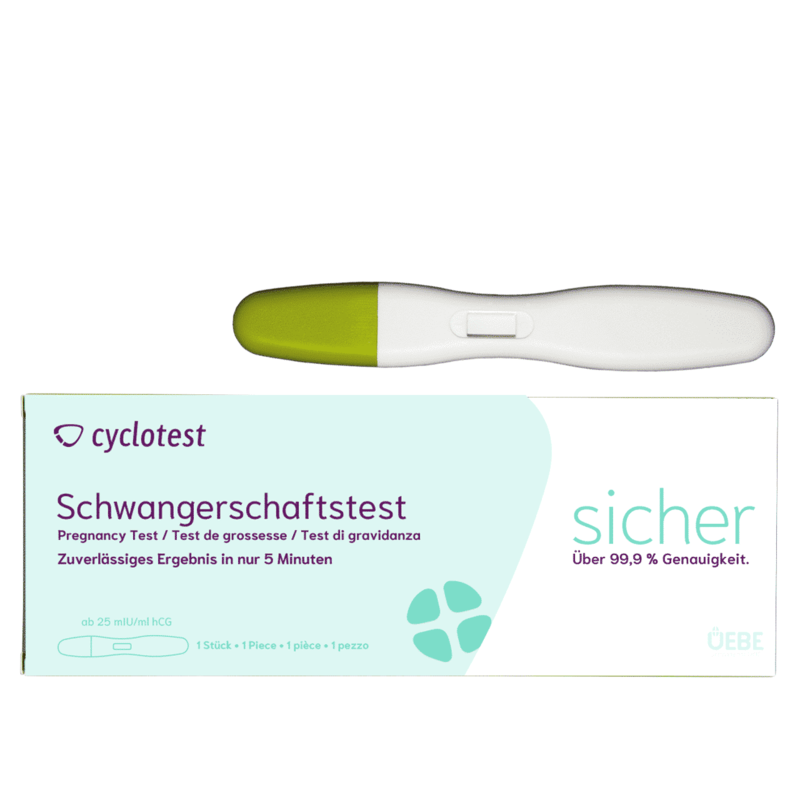 cyclotest offers both a traditional pregnancy test and an early-detection pregnancy test. 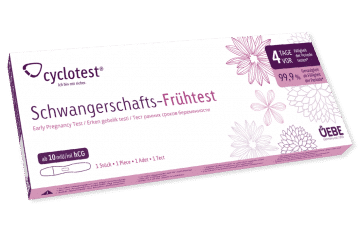 If you wish to become pregnant, choosing the “child planning set” is your best option as it contains ovulation tests in addition to the early detection tests. You can find more information about these products below. 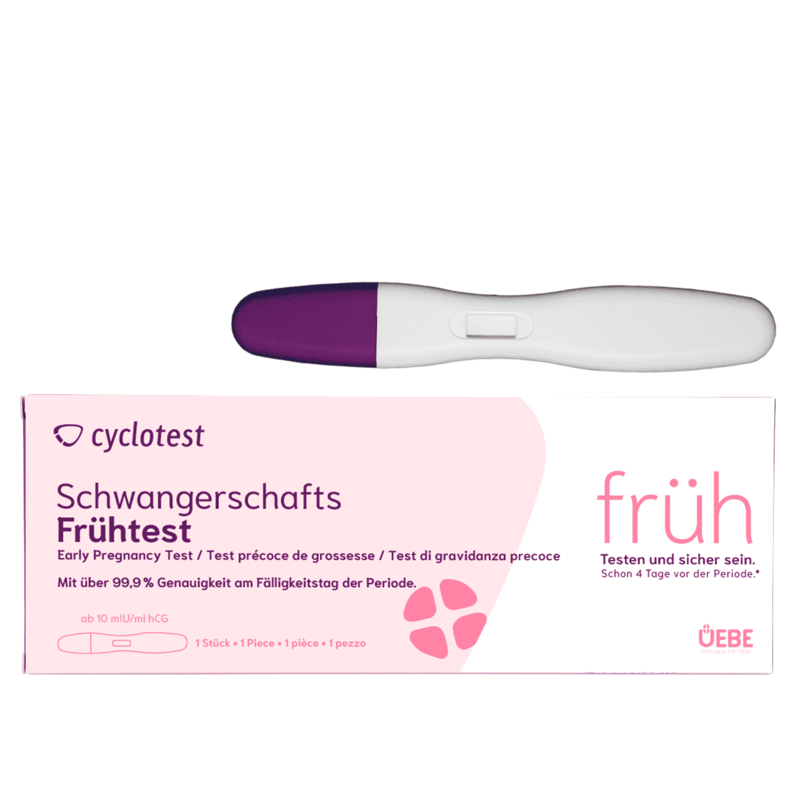 The cyclotest pregnancy test shows positive results in samples with a hCG level of approximately 25 mIU/ml or higher. Simply immerse the stick in the urine sample for 10 seconds and read the result after only 5 minutes. Comparative studies using authorised laboratory equipment were conducted in various clinical reference laboratories. The test results evidenced a concordance of >99.9%. The test can be performed at any time of the day, but the first elimination of urine in the morning is preferred. Consumption of alcohol may distort the result. The test can be used beginning with the first day of your missed menstruation. At this point, the test shows a correct result in the majority of cases. 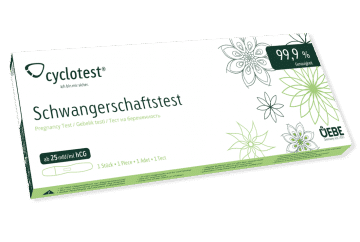 The cyclotest early-detection pregnancy test shows positive results in samples with an hCG level of approximately 10 mIU/ml or higher. Simply immerse the stick in the urine sample for 10 seconds and read the result after only 5 minutes. Comparative studies using authorised laboratory equipment were conducted in various clinical reference laboratories. The test results evidenced a concordance of > 99.9%. The test can be used up to 4 days prior to the start of your regu­lar period. At this point, the test shows a correct result in the majority of cases.